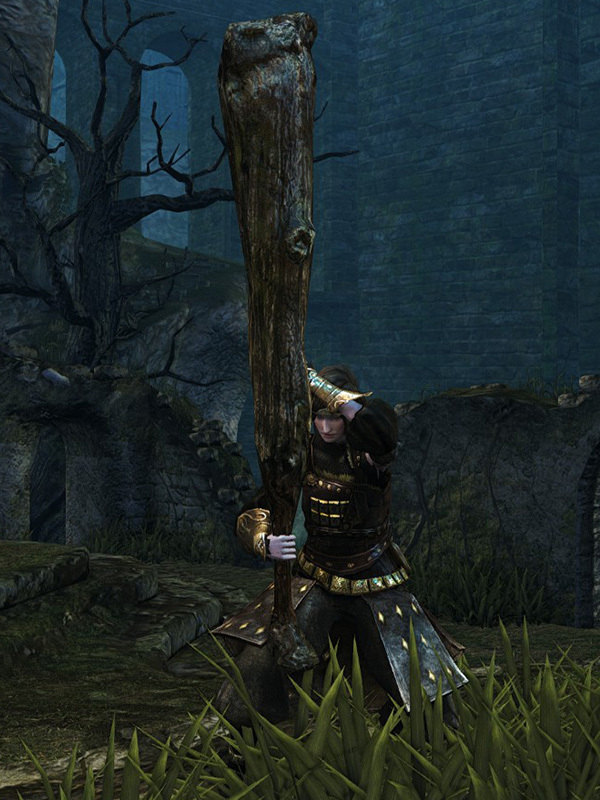 Giant tree branch serves as a wooden club. Smashes enemies from upside the head. and this giant club is no exception. At 99 Strength and 99 Intelligence, an Enchanted Great Club has the highest Attack Rating in the game (692 one-handed, 823 two-handed). R1 — R1 — Right-to-left horizontal smashes. Roll — R1 360 degree horizontal spin attack. Backstep or Run — R1 Running overhead smash. Forward + R2 Leaping overhead smash. L2 (left hand) Left-to-right horizontal smash. Roll — R1 Fast ground slam. R2 and jumping attacks are replaced by a slow, heavy leaping overhead smash. Great Club durability reduced to 25. Base damage increased. Cannot repair weapon (except through reinforcement). 25% STR scaling, 63% INT scaling. 18% STR, 62% INT scaling. Unknown amount of additional INT scaling. 34% STR scaling, 63% FAI scaling. 32% STR, 74% FAI scaling. 1. When two handing this weapon, only 19 Strength is required.